If you are a family breadwinner with dependents, financial planners suggest carrying ten times your annual income. If you are a non-working caregiver at home, we suggest your choice of $150,000 to $500,000. If you are looking for burial coverage only, we suggest $5,000 to $25,000. Click here to access the Life Happens life insurance needs calculator. vape or tobacco substitute use? Nicotine use of any kind, including marijuana use, is looked at very closely by all life insurers. Smoking, chewing, inhaling in a vaporized form, consuming in edible products, and wearing a patch on the skin, all constitute use of these products. Non-admittance of marijuana use can result in a decline. Sources of information the insurer may use include: statements made on your application, telephone interviews, your paramed exam results (if one is required), your outside medical records and your Medical Information Bureau (MIB) profile. If you currently use marijuana AND any product containing tobacco or nicotine, please select the response that most closely describes your tobacco or nicotine use. Always be 100% honest when you answer tobacco use questions to ensure accurate quotes. Remember, a false statement on an application for insurance could void your coverage. Did you think that life insurance companies look only at your health history? Not true. Today, life insurance companies look just as closely at many non-medical aspects as they do at your health. Items looked at very closely include disability, receiving government benefits, open bankruptcy, U.S. citizen status, hazardous activities such as mountain climbing or racing, intended foreign travel to dangerous countries, private pilot intentions, scuba diving habits, driving and criminal record status. In order to receive an accurate rate quote, always be honest in your answers to these questions. Do you work at a paying job (employed or self-employed) 30 or more hours per week? Do you intend to participate in commercial aviation, private aviation, scuba diving, motorized racing, mountaineering or rock climbing, travel to any country on the U.S. State Department's Travel Warnings list, or any other potentially hazardous activities? Specify the type of climbing, years of experience, average heights, degree of difficulty, and other details related to your mountaineering and/or rock climbing. Specify the type of racing, years of experience, type of vehicle and track, and other details related to your motorized racing activities. Specify the exact purpose of travel, locations to be visited, number of days expected in coming year. Specify the exact type of activity and other details related to the potentially hazardous sport or activity in which you participate. What is the maximum depth to which you will dive? Select...Up to 30 ft.Up to 50 ft.Up to 75 ft.Up to 100 ft.Up to 125 ft.Up to 130 ft.Over 130 ft. Within the last 5 years, have you been convicted of either reckless driving or driving while under the influence, received 3 or more moving violations or had your license suspended or revoked? Have you ever had any other criminal convictions, law enforcement infractions of any kind or been on parole or probation? Excluding cosmetic surgery, has any doctor recommended any medical test or procedure that you have not yet completed? Have you been diagnosed with any medical conditions in the last 10 years or taken any prescriptions medications (including from a dentist) in the past 3 years? Why am I being asked about my blood pressure? Hypertension, also called "elevated blood pressure" or "high blood pressure", is looked at closely by all life insurance companies. If you don't remember your last readings, it's OK to choose "I don't know" as your answer. In that case, we'll assume that you do not have a history of hypertension and we will show you the lowest possible rates. If you choose a plan that requires a paramedical exam, which is really a face-to-face interview or "mini-medical" then our technician will check your blood pressure at that time. 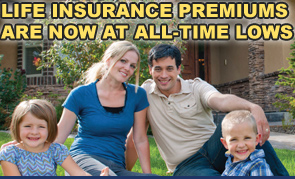 If you need personalized advice or help, call our insurance counselors at 1-866-659-6081.